The days are getting shorter and there is definitely a chill in the air and this is around the time of year I start to think “perhaps I’ll have an extra half hour in bed” or “I’d rather put my pj’s on early and drink tea than go for a run”. Who’s with me? Totally justifiable behaviour. BUT, I have my eye on a few goodies that are going to keep me kitted out for the colder weather ahead and keep motivated (and are of course totally necessary). So I have a little pink/purple theme going on here which was initially unintentional but I’m loving. All but one item were sourced from Asos. Asos are an amazing source for all your activewear needs right now. Literally stocking everything you could possibly need really, which is great. So those are my edits. Something I’ve not done before but thought it would be fun and perhaps useful. What does exercise mean to you? September 6, 2017 December 30, 2018 by naturalleaLeave a Comment on What does exercise mean to you? I work with a lot of people who see exercising as a real challenge and something that only very fit people seem to be able to adhere to. Exercise to many is joining a gym, which some people find boring or not particularly enjoyable. Often the idea of exercise musters up unhealthy ideas about body image and what a fit person should ideally look like aesthetically. When really exercise should be about keeping a healthy mind and body through movement. Healthy comes in all shapes, sizes and forms. And the way you keep yourself healthy should be something that works for you. I like to bring it back to basics. Activity. I always ask patients/clients “what activities have you been doing?”. Activities can mean anything from a walk along the beach with the dog and the family, gardening, painting your living room, to a 20 minute hiit session in the garden. Just make sure you move! Of course, there are some that want to push themselves and set themselves goals to push themselves further. Great stuff! But I also urge those that get very little activity in to their lives from one week to the next to just start small. Start small and build up. Go for a walk and some fresh air in your lunch break, go for a swim, take a walk with the kids to the park. Just keep moving and find something you enjoy. Keep your mobility going and keep your energy up and try to adhere to it. I work with someone who has arthritis in one of his knees which makes a lot of exercise very difficult, this summer he’s discovered kayaking. He cannot get enough of kayaking, and has been going three or four times a week. I’ve personally had a very busy summer and the autumn/winter looks like it’s heading the same way. This means my running and yoga tends to be the things that get reduced in my schedule. This is something that really frustrates me but often I’m just juggling too many balls (desperately wanted a better phrase here). But one thing I never remove is walks with my little Amelie and my Oli. 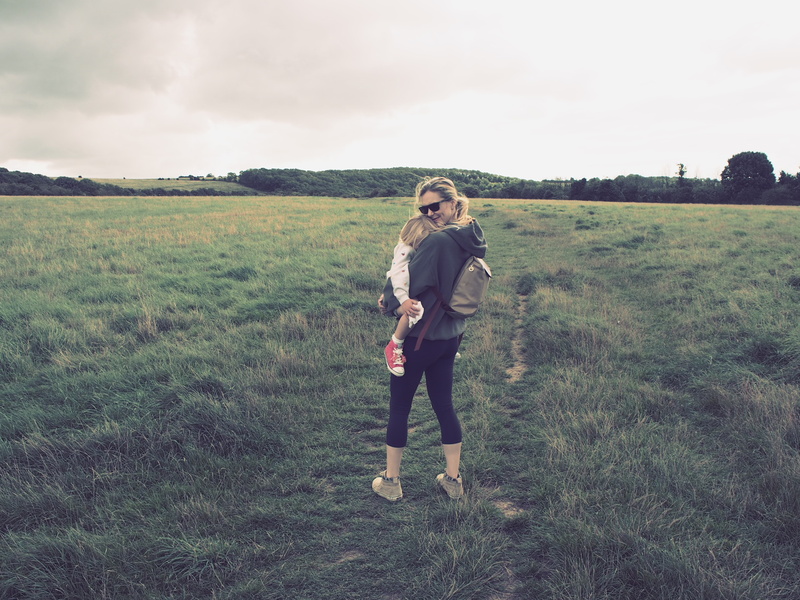 When Amelie was a baby we would go for walks with her in the pouch (baby carrier) or the buggy. Sometimes we would do this every day, sometimes just a few times a week. So when running and all the other crazy sports/hobbies I’ve tried over the years were out of the question, walking was always something I could do and enjoy. This has just been our ritual ever since. Amelie loves going for walks and exploring. Come summer, autumn, winter, spring, our walks are always constant. Don’t get my wrong there are times when she likes to have a little carry (as per picture above) but she’s getting far too big for this now, something she refuses to accept. So, I’ve set myself a few little goals to keep me active and keep me smiling. One is a winter 10k run with friends (we get a medal AND a mince pie at the end) and one is a yoga challenge to keep my practise consistent. So book some time in your schedule, do something ACTIVE, keep your body moving!! Don’t let the autumn/winter season keep you from doing your activities.